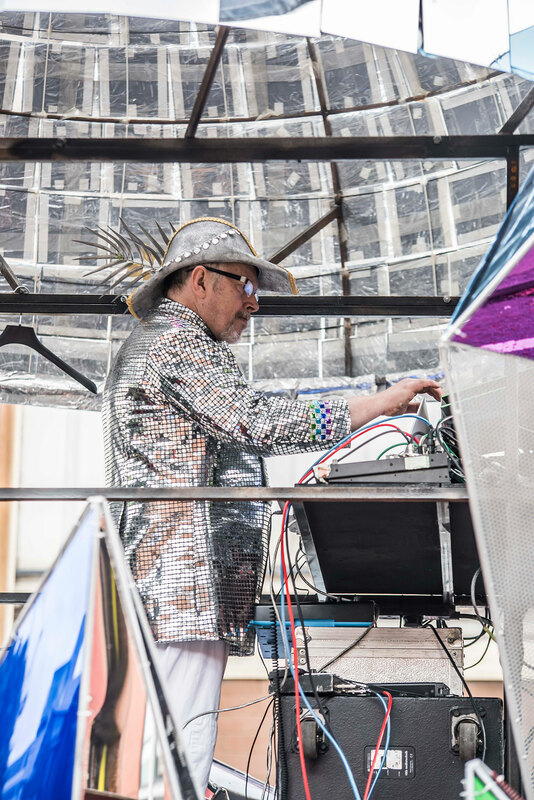 In 2016, supported by Walk The Plank’s ELEVATE programme, Will Lenton collaborated with pioneer of electronic music and Manchester legend, Graham Massey. 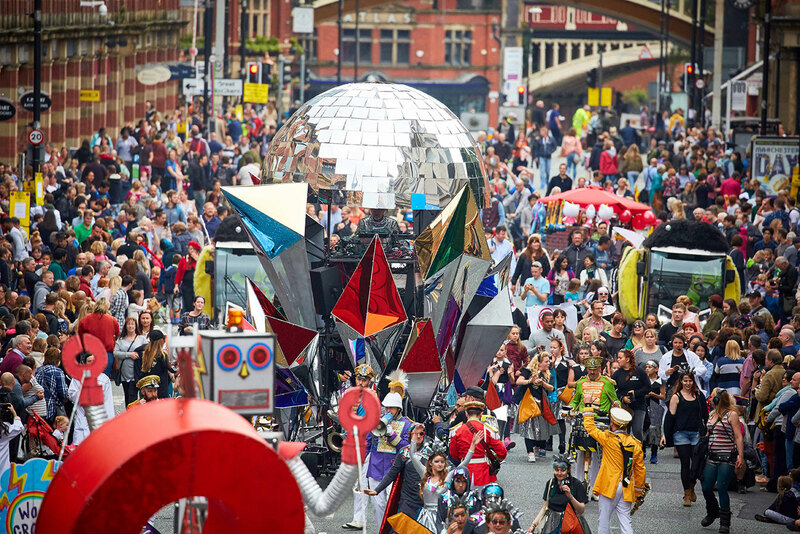 ELEVATE ‘16 paired renowned artists with mid-career artists from the North West, enabling them to share skills throughout the development of a parade and bringing to life the local community’s artistic concepts on The Manchester Day. Working with Mr Wilson’s Drummer Howard Jacobs, Will and Graham explored new arrangements of acid house tunes such as 808’s ‘Leo Leo’, combining Graham’s analogue expertise with Mr. Wilson’s live performance. Howard worked with Graham to programme midi beats and recreate the drum tracks from the original 90’s acid house tunes. This culminated in a mobile, electro-brass spectacle during The Manchester Day Parade. Through sampling and additional digital production, Graham was able to manipulate the overall live audio, adding impressive volume and effects whilst moving through the street. Sound design experts TubeUK were engaged to support this technically challenging performance. In order for the rig to be completely mobile and able to parade, TubeUK had to incorporate all their equipment into Graham Massey’s float. 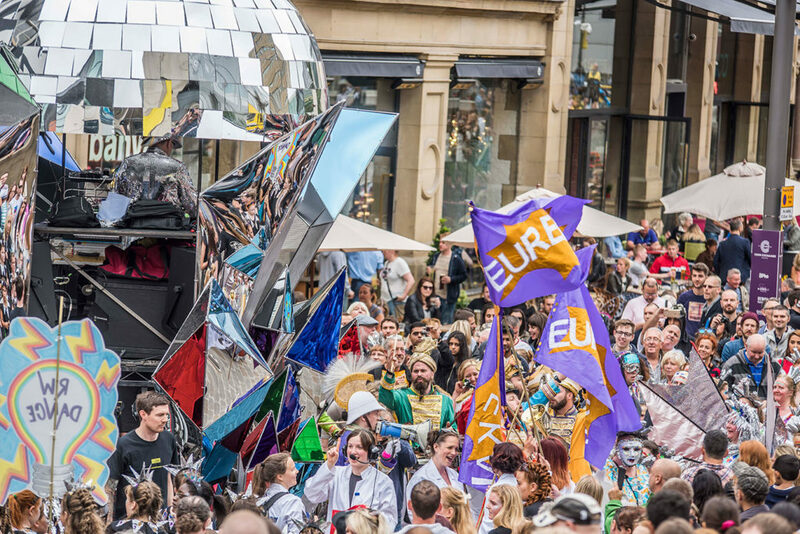 This float took the form of a spectacular, giant glitter-ball created by metalworker and artist, Hannelora Johansson. The high point came as Massey’s float entered Exchange Square in Manchester and the audio link was beamed via RF transmitter to a receiver onstage, sending signal and seamlessly transferring the sound to the higher-powered PA. This created a sonic tidal wave, engulfing spectators in a rave soundscape reminiscent of a 90s warehouse party. “It was a fantastic experience to work with Graham and Mr. Wilson’s Second Liners and to see their collaboration have such a positive impact on the event” – Melvyn Coote from TubeUK.